LinSSID is graphically and functionally similar to Inssider (Microsoft™ Windows®). It is written in C++ using Linux wireless tools and Qt4. LinSSID displays the information available from iwlist tool in graphical format. 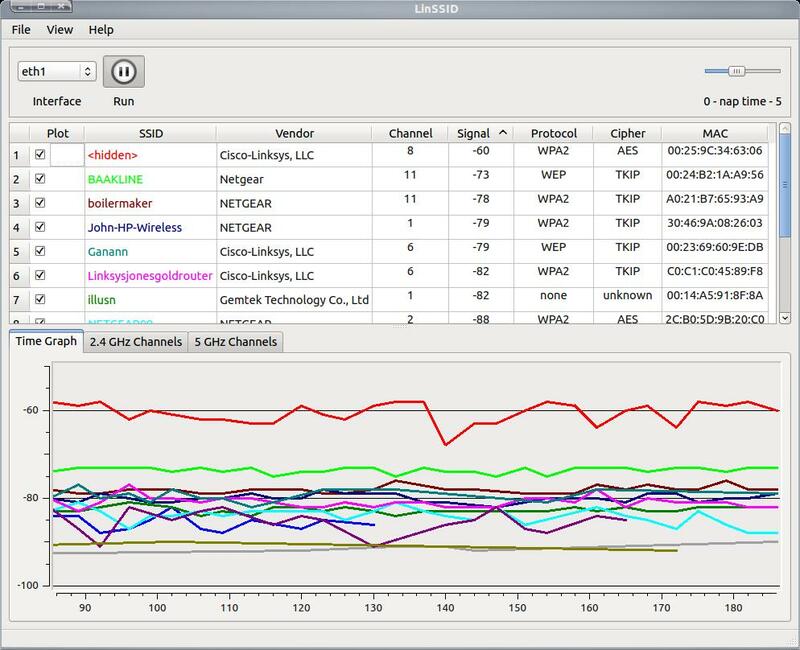 LinSSID displays a table of all of the local wireless networks that your device can receive, and information about them. 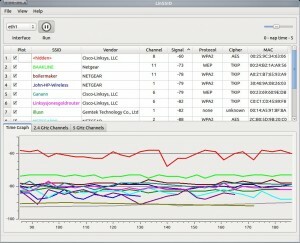 It also displays charts of the signal strength of each network by channel number and over time. LinSSID will work with more than one wireless device attached to a system, but only one at a time (selectable). LinSSID requires root privilege to run the iwlist tool. It can be run in one of two ways to do this. The preferred method is to launch LinSSID as a regular user and let it ask for a password. It will then use the password to get iwlist information, but LinSSID itself will not run with root privilege. Alternately, LinSSID can be launched with root privilege. This second method is less secure since any misbehaving code in the program could possibly have detrimental effects on the system. LinSSID is multi-threaded, using the main thread to communicate with the main window and the user while a second worker thread keeps a named pipe filled with iwlist data. The LinSSID interface is build with QT4 and libqwt tools. The boost c++ regex library is used for scanning and converting iwlist output. LinSSID may be installed either by downloading source or binary from this site, or if you're using Debian/Ubuntu or one of its brethren, adding a ppa to your software sources and then installing it with your favorite application manager.